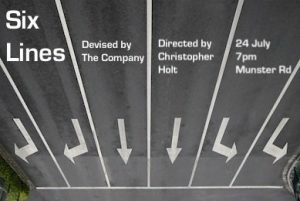 The Company have been working on a short performance, Six Lines, which is directed by Christopher Holt. The performance will be on Tuesday 24 July, 7pm at 61 Munster Road, SW6 5RE. The performance will last between 10-15 minutes. This is a great opportunity to see what The Company have been working on for the past few weeks and meet other people associated with Outside Edge. If you are able to join us please RSVP to admin@edgetc.org by midday on 24 July.